From the remains of a Viking settlement discovered deep beneath Coppergate Street, to the medieval wall surrounding the old city and the splendour of Castle Howard (the setting for TV's Brideshead Revisited), York is a city richly steeped in history. It is one of the most interesting and popular cities in the UK, attracting a steady flood of local and international tourists. Founded in the year 71 AD, York is located at the convergence of the Ouse and Foss Rivers, and was thus a strategic northern hub, passing through the hands of the Romans, Saxons, Vikings and Normans respectively. The varied history of the city is evident in its magnificent architecture - from Viking ruins to the spectacular York Minster cathedral. Northern Europe's largest Gothic Cathedral, the Minster took more than 250 years to complete, and is an impressive and photogenic structure surrounded by beautiful gardens. This is not just a city of history, however, and the presence of York University makes for a lively mix of the old and the new. 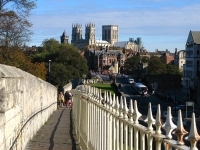 There are plenty of shops, bars, clubs and restaurants, and weary travellers in York can spend their afternoon in one of the city's excellent tea rooms or coffee shops, while the evenings offer West End-style shows at reasonable prices, and plenty of places to find some solid English pub grub.